About 1,500 people were injured in the Italian city of Turin after a firecracker provoked a stampede on Saturday night, police say. Thousands of football fans were watching a live relay of Juventus' Champions League final against Real Madrid in Cardiff when a bang was heard and rumours of an explosion spread. At least seven people, including a seven-year-old child, were seriously hurt, local media say. It is the 12th Champions League title for Real Madrid. 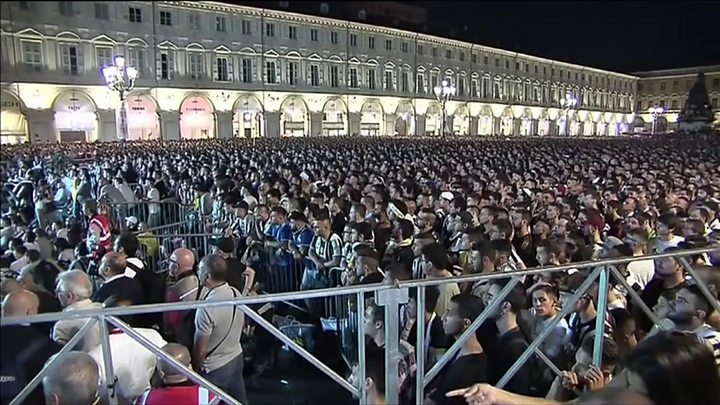 With 10 minutes of the second half remaining, crowds rushed away from the centre of Piazza San Carlo, crushing people against barriers. Bags and shoes were left scattered on the ground as people ran screaming out of the square. Some of the injuries occurred when a barrier around the entrance to an underground car park gave way. While most of the wounded had cuts on their legs and arms, seven were still in hospital, local media reported. Three of them were reportedly in a critical condition, including a seven-year-old boy who had head and chest injuries after he was trampled by people rushing to escape. There was anger locally that the authorities did not do more to put in place proper crowd control measures, the BBC's James Reynolds in Rome reports. For some Juventus fans, the incident brought back traumatic memories of the 1985 Heysel stadium disaster, where 39 people, most of them Italian fans, died after being crushed against a wall that then collapsed before the European Cup final against Liverpool.